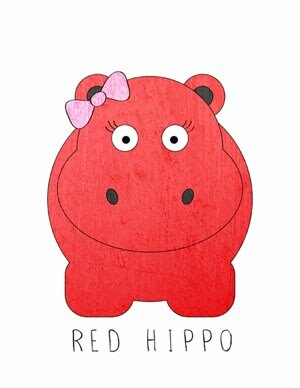 Red Hippo: easton's 'un-pinterest' birthday party. although i absolutely love throwing swanky/detailed/chic parties, i really didn't feel like doing that for easton's third birthday. maybe i wanted to keep his party low key because i'm busy, maybe it's because i didn't want to spend a ton of money, and most importantly…i just wanted the kids to have fun and expend so much energy that they took a nice long nap when the left. here's what we did to prepare. i took easton to the dollar store to pick out his decorations. he chose dinosaur figurines, panda plates, a happy birthday banner, a special candle for his cake, and colorful balloons. i went to michaels and bought big canvases for all the kids and lot's of paint. i figured i could have painting a canvas double as a birthday party activity AND the party favor (who doesn't want a painted canvas hanging on their wall?!?). for months, all i heard from easton was that he wanted a jumpy house and a chuggington birthday cake at his birthday party. SOOOOO, i bought two chuggington trains for his birthday gift and plopped those bad boys (with festive party hats that i made specially for them) on the cake and called it a day. i decided to splurge on the jumpy house (because i knew that the kids would have so much fun with it) and rented one that had a HUGE slide on one side. the kids had so much fun- the food was great (togos sandwiches), and all the kids left with a painted canvas to hang on their bedroom walls. it was a beautifully simple birthday party, the kind that was JUST about kids having fun and not about making it look perfect. i loved it. easton really loved it (which is all that matters).